BART has fallen behind schedule in rolling out its "Fleet of the Future" cars due to unexpected technical glitches. BART had hoped to have more than 150 of the new cars running by now, but instead, there are only 20, with the rest sitting in the repair shop waiting for a host of fixes. "They run the gamut, everything from a door that doesn’t open to a sign that doesn’t work," BART spokesman Jim Allison said. 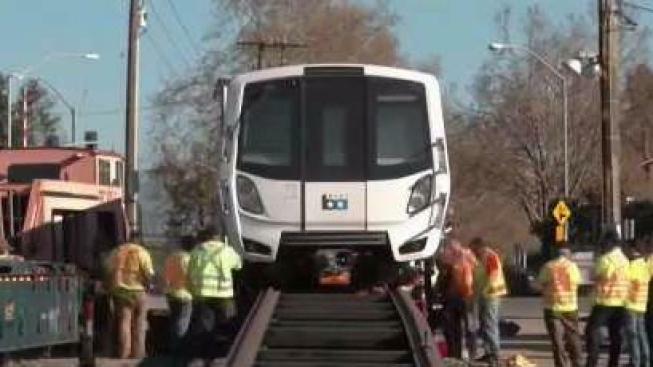 Before BART riders can enjoy the clean, sleek and comfy Fleet of the Future cars, they’ll have to wait for the cars to undergo hundreds of repairs and final testing, Allison said. "It’s disappointing for us and frustrating for riders that we don’t have more of these cars," he said. BART’s new fleet began rolling out in mid-January. Since then, BART says, there’s been 641 work orders on the new cars. "Anytime you have that many changes being introduced to the new system, you’re going to have bugs to work, out and that’s what we’re doing before we carry passengers in these cars," Allison said. Many of those orders are preventative measures like special tests and inspections, he said. Other repair orders involve software issues, door problems and brakes stopping the train when they’re not supposed to. "The cars are safe, but are they reliable? That’s the question right now," Allison said. The Canadian company that manufactures the new train cars is footing the bill for the repairs. Bombardier signed a $2.5 billion contract with BART to supply the new cars. Allison said BART is working closely with Bombardier to resolve all the glitches. That's key, he said, since the new cars will be carrying passengers for the next 40 to 50 years. "In the long term, this due diligence and slow pace will pay off," he said. BART added it’s going to take several months to complete all the repairs and testing. It is hoping to have the old train cars entirely replaced by 2022.